This is the third installment of a series of posts that summarize my progress in developing a workflow that will better accommodate my new Canon 7D DSLR camera. In Part 1 I described some of the features of this camera that drove me to refine my workflow, which by the way is still very much ongoing. In Part 2 , I outlined my existing workflow. In this post, I will begin to describe some of the changes I am making. Remember, the major reason I want to change the way I do things is because the 7D records full HD video, meaning 1920x1080p at 30 fps using H.264 compression files wrapped in a MOV file format. This places a big strain on the computer to edit or even view these files, and they take a large amount of disk space to store. Another major challenge to my existing workflow is the video files are stored as .MOV files. As you probably know, the PSE 8 Organizer can read these files, but it cannot use these videos in the Slide Show Editor. I routinely want to make slide shows that include both still images and video clips. For me, the PSE Slide Show Editor is the easiest way to make the presentation itself. This means I need a straightforward way to intermingle these .MOV files with my still images. Another factor I need to consider is how I am shooting the video clips. Since I am using the same camera for both still images and the video clips, these two basic file types are interspersed on my memory card after I have finished a photo session. Maybe I am making this too complicated for myself and trying to tackle too much at one time, but it seems I need to have multiple workflows or sub-workflows to handle various situations. Plus I need them yesterday, because I keep on taking pictures and videos and my organizing challenges increase at an ever growing rate. Use PSE 8 and PRE 8 to do everything. These two programs certainly work well together and PRE 8 has far more capability than I can effectively use now. There are some issues that arise in using these two programs exclusively. Use PSE 8 in conjunction with Movie Maker and Vista/Windows 7 DVD Maker. This is important to me, because I have a class that uses basically this workflow. The schools where I teach do not have the funds to buy Premiere Elements in the near term. For those people and classrooms that are not using a Vista or Windows 7 PC, there is a modification to this workflow that is required. Use a hybrid of either of two basic workflows above, but work with transcoded video files rather than the raw HD files. 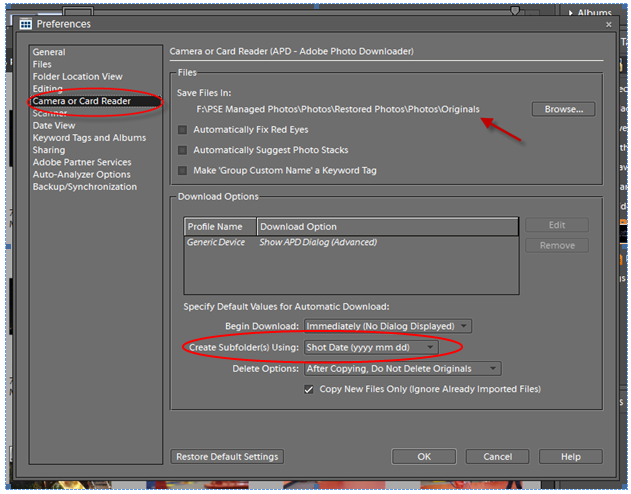 This is a popular approach with a large variety of programs, and formats to transcode the original Canon 7D files. I have experimented with these basic workflows with mixed success. As I begin to describe them multiple subtopics come up that need to be explained and understood better by me and anyone reading these posts. The first thing I decided to do was to manage my HD video files in a separate PSE 8 Catalog, which I named H264. This is not my first venture using multiple catalogs, although the vast majority of my photos are managed in a single Catalog. For example, I use a separate catalog for all of my beta testing work. Also, like most everyone else who has PSE loaded on two computers, I have one Catalog for my desktop and another catalog on my laptop. As you know, the Organizer’s preferences are not Catalog unique. The preferences are the same for all Catalogs as set by Edit > Preferences in the Organizer. So, even though my videos and still images will be managed in different Catalogs, their physical files will be in the same folder if they are shot on the same date, because this is how I have the preference set as shown in the figure below. Another fallout of using separate Catalogs for my video images is that I need to go through the import step twice, once for my still images contained on the card, change catalogs, and then import videos only into the video catalog, in my case the H264 Catalog. Already, my process is getting harder. Hopefully, as I use it more I will see the benefits downstream. Since I wrote the above, I have returned from a week’s vacation in Hawaii. While on vacation, I shot something like 750 photos, and about 45 video clips, all using my new Canon 7D DSLR. All of the still images were shot using the RAW format and the video clips are all Full HD, meaning 1920x1080p. Being able to shot both RAW images and then immediately switch over to video worked very well. I did not have to take an additional camera and then decide which one I would carry with me for a particular activity. Although I had my laptop with me and routinely uploaded my pictures and videos to it, I was able to get everything on the three 8 Gb cards I took with me. Well now that I’m back, I need to try out my evolving new workflow. After importing the pictures and videos to their respective catalogs, I backed up each catalog in my usual manner using the PSE 8 Backup command. Next, I picked about 170 pictures that were at least good enough to make 4×6 prints of and sent them to Costco for printing. I uploaded all of these to the Costco website, and then picked them up at the local store in about two hours. I only edited a few of these pictures, most were as shot with the RAW image converted to JPEG format. The cost was about $50 to get two copies of each picture, one for my wife and one for my daughter. Now I’m ready to begin working with the video. My first project will be made using the PSE 8 and PRE 8 workflow, but I will not intermingle any still images for this initial project. My goal is to produce a standard definition DVD consisting only of video clips. A later project will add pictures. Ok, to sum this part, I’ve identified three main workflows, each of which will probably spawn multiple sub-processes, described my video-only catalog approach, and identified a couple of impacts of using a separate Catalog for my video files. Now I need to work the steps on the pictures and videos from my Hawaii trip. Please comment or leave questions regarding this and the other articles. I would love to hear from you! I have just updated my website with the classes I will be teaching this fall for PV NET. Actually the first one starts in late August. Click here to see the schedule for each of the schools where I teach. I have my South Bay Adult School schedule. I should know my Torrance Adult school schedule for the fall shortly.